7 chambres, 7 salles de bain et demi! 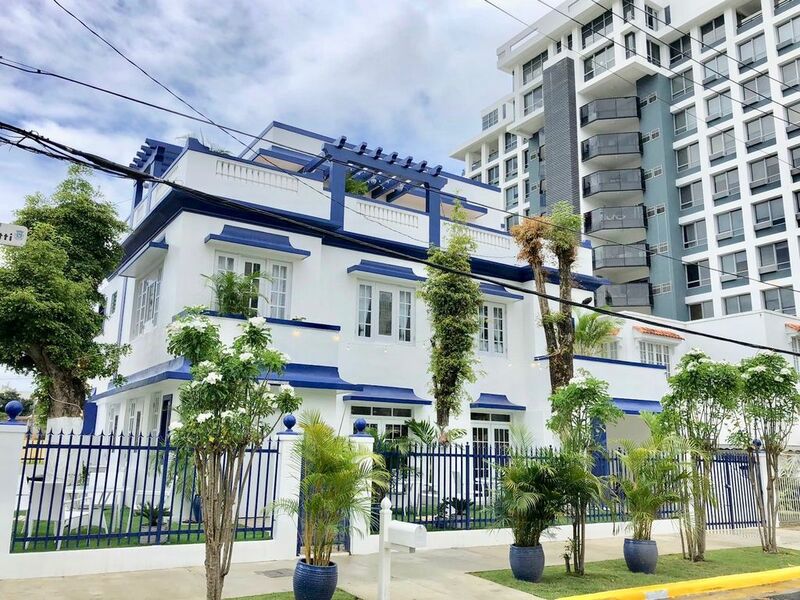 La maison de style espagnol traditionnel rencontre le chic contemporain niché dans le quartier balnéaire de Condado, à quelques rues de l'océan et à proximité de nombreuses attractions captivantes. Nous sommes à une courte distance du vieux San Juan, du centre de conventions de Porto Rico et bien plus encore. Nous avons six suites des Caraïbes et un grand studio pour votre choix. Beaucoup de terrasses et espaces extérieurs aussi! -Caribbean Suites (x6): chambre queen pour deux personnes et deux fois plus de plaisir. Cette chambre privée comprend un lit double, une salle de bains privative et un balcon. Studio privé avec un lit king size, un lit simple, une kitchenette, une télévision à écran plat, une salle de bains privative et une grande terrasse. La literie, les couvertures et les serviettes de bain sont fournis pour votre confort avec la climatisation. C’est une marche au 2e étage, pour vous garder en forme pour la plage! 16 of us went down to San Juan for our friend's bachelor party. Yes, you read that right - 16 and yes we had an amazing time. Six stayed at La Concha Resort while the other 10 rented out the entire property at Casa Los Cummins from Thursday to Sunday. The photos on the site do not stack up to how awesome this house is. The rooms are far more spacious than the photos appear. Just about all of the seven rooms have access to its own private balcony/terrace/sitting area, and the rooftop hangout area is big and accommodating with multiple couches, table, and chairs. There was more than enough room for all 16 of us to hang comfortably. The host was very friendly and helpful throughout our entire stay - providing us with lists of restaurants, night life spots, and various activities to do around San Juan and the surrounding areas. She also made herself accessible via phone call or text 24/7 for any questions we had. Casa Los Cummins is only an eight minute walk to La Concha Resort and Casino where the others stayed, and just two or three blocks away from the beach. It is very close to the Walgreen's and the 24-hour CVS. Overall, our stay at Casa Los Cummins was 10/10 - from the home itself, its location, to its safety and security features. Will DEFINITELY be staying there again in the future, but hopefully not with 16 dudes next time. The one tip I would share is if you are staying here or in the Condado Beach area is to rent not just a car, but a Jeep. The potholes are enormous, and with street parking the roads can become real narrow real quick. We always had a place to park in front of the house, and were told if we couldn't find parking there then the host would provide us with a parking pass to a parking lot a couple of blocks away. So again, very accommodating. Condado est l'endroit idéal pour toutes vos aventures à Porto Rico! Condado est également idéalement situé à l'est du quartier historique du vieux San Juan, ainsi qu'au nord des zones métropolitaines de San Juan. Room rates are different for each room/suite/full house. Please inquire about our different room rates, discounts, and extended stay rates.